Trongsa district is situated at the very center of the country of Bhutan which makes it a critical junction of roads leading to Bumthang, Gelephu and Punakha. Paradoxically, staggering mountain ranges curb its accessibility. The main town of Trongsa is situated quite high up a cliff with stunning views of the Black Mountains. The town is relatively big with beautiful shops (interestingly most of them are white) and a strong Tibetan culture (many Tibetan immigrants thronged the town from late 1950 to 1960. About 80% of the Trongsa district lies in an environmentally protected zone. There is the Wangchuk Centennial Park in the North and Jigme Singye National Park in the central and Southern parts of Trongsa. The south east and north east sides of Trongsa are protected by Biological corridors and they lead up to Thrushingla National Park. Trongsa has many attractions and spending a day or two in this beautiful place can be a worthy investment. The town’s historical past is significant since unification initiatives began here and the royal family has their ancestral home in Trongsa. In fact, Ugyen Wangchuk, the first monarch of Bhutan and his successor Jigme Wangchuk ruled Trongsa from the Dzong. It’s a tradition for the king to first hold the position of Trongsa Penelop before he ascends to the throne. Interestingly, Trongsa is a great destination for shopping for weaves (most of them are wool based colored with natural dyes). Machine spun carpets are also a popular item that you can shop for. The prices of textiles and carpets is lower than in Thimphu. From Thimphu to Trongsa the full can fare is 3383 NU (the distance is 192 km). If you are travelling to Trongsa via Eastern Bhutan Dzonkhangs then Trashigang is a convenient option. Direct cabs to Trongsa from Trashigang are available and the fare is 5984 NU for a distance of 294 Km. You can also choose to travel from Bumthang to Trongsa (distance 79 km) and the taxi fare is 1156 NU. From Gelephu to Trongsa the distance is 300 km and the taxi tariff is 4148 NU. From the Western border town of Phuntsheoling to Trongsa, the distance is 347 km and the taxi tariff is 6086 NU. From Paro to trongsa the distance is 233 km and the taxi fare is 4088 NU. Many tourists actually drive to Trongsa via Wangdue and Phobjika/ Gangtey and then move on to Bumthang (23 km away) after covering Trongsa. If this is what you plan to do, you will be rewarded with lovely scenic views along the way as you cross important landmarks. Read this page to know about the drive & the journey between Wanddue and Trongsa. From Thimphu, a coaster bus runs every morning at 7 a.m. to Trongsa (reaches at 3 p.m.). If you are travelling from Southern Bhutan then you can avail Bus from Gelephu that runs on Monday, Wednesday and Friday at 7 a.m. to 5.30 p.m. The Punakha Dzong might be the most beautiful Dzong in Bhutan but the Trongsa Dzong is the most majestic. This irregularly shaped, huge dzong has an archaic grandeur which can only be felt not expressed. The view of the Dzong is the first thing to greet you as you approach the Trongsa town. The courtyard of the Dzong sometimes holds archery contests and that’s a grand sight to behold. Incidentally the words Trongsa Dzong mean Dzong on the tip of Dungkhar or Conch which totally expresses its location as it has a very sharp drop to its south. There are two ways to approach this Dzong; the gentler walk through the eastern gate and the steep climb (a good cardio workout) on the Mangdue foot trail that ends on the Western traditional gate. Trongsa Dzong overlooks the Mangdecchu River and was founded by Pema Karpo’s disciple Yingzin Wangchuk. Legends say the Yungzin used to meditate in Yueli Village and from there he saw magical butter lamps at the site of the Dzong (later he discovered hoof prints of Pelden Lhamo) and present Trongsa town. Inspired, Yingzin built a meditation chamber at the site and then a small temple. Afterwards small homes were built and this was the foundation of Trongsa town. The meditation quarters and temple was called Mondrupley and they have now expanded to constitute a maze of hermitages, retreats and temples that lie just below the main dzong. The actual dzong was built by Chhogyel Mingyur in 1644 and then enlarged by the end of the next century by Tensin Ranbgye. Later it was damaged in 1897 earthquake and was subsequently repaired. The dzong had a lot of control over the east to west trade flows and traditionally Bhutan Kings used to serve as Penelop (ministers) of this important dzong before ruling the country. The Same monk body who stay in Bumthang in the summers spend the winters in Trongsa. There are 23 Lhakhang’s in the dzong and not all of them are open to public. 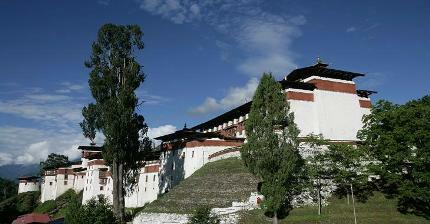 The assembly hall in the north and the beautiful Mithrub Lhakhang in the south are the most important visiting points. Mithrub Lhakhang holds the funeral chorten of Ngagi Wangchuk. The dzong is also where the famous 5 day long Trongsa Tsechu is held (check page on Bhutan festivals). The Ta Dzong is the watchtower that had been guarding Trongsa district from internal conflicts since the last many centuries. Since the Ta Dzong is strategically placed right above the Trongsa Dzong, you should club together a visit to these two dzongs. It’s possible to drive up here or to access the dzong via a steep staircase. The Ta Dzong was constructed by the first Governor of Trongsa in the year 1652 and it has 4 different observation points named Dragon, Garuda, Tiger, Lion. You need to progress up a steep path to reach Ta Dzong. There is a small shrine inside which represents the memory of the famous warrior king Gesar. A view from the watchtower gives tourists a glimpse into the critical importance of Trongsa in the history of Bhutan. The museum in the Dzong is one of the more important displays in Bhutan and was opened to the public in 2008. The museum was built to commemorate enthronement of the fifth king, completion of a century of the Wangchuk monarchy and the advent of democracy in Bhutan. There are 5 floors and 11 galleries of significant displays of art, craft and royal memorabilia. Some of these are a 500-year-old jacket used by Ngagi Wangchuk, Raven crown, swords used by Penelope Jigme Namgyel and Third king and the boots used by the teenage fourth king. Statues that depict the story of Bhutan are also displayed. Religious items of interest are the biography of Guru Rinpoche (Padma Kathang) which was written by Yeshe Tsogyel. The Ta Dzong contains 2 lhakhangs including the 19th century Gesar Lhakhang (it has a huge 3-dimensional mandala). There is a media room where tourists can watch documentaries on the Bhutan monarchy. Browse through the souvenir shop and sip a cup of coffee in the cafeteria (it has a wonderful view). You can also choose to have lunch here though for this you need to call beforehand. Interestingly, the museum curator is a member of the Ministry of Culture and Home affairs. Every year, a meditation practice for the welfare of the whole district is held in the Ta Dzong. The Thruepang Palace (built in 1920) is not a very grand structure but is famous for being the birth place of the erstwhile king Jigme Dorji Wangchuk (born on 2nd May 1928 to King Jigme Wangchuk and Ashi Puntsho). The childhood of the king was spent in this palace. The present King of Bhutan uses this palace when he travels to and through Trongsa. To reach this palace, you need to drive for an hour (23 km) on the fresh open countryside above a breath-taking river gorge. The scenery is spectacular and the farm fields on the way present much to observe and photograph. The Kuenga Rabten palace (built in 1929) is visible from the distance…this was originally the winter home of the second king. Right now, the National Commission for Cultural Affairs looks after the palace. The visit to the Kuenga Rabten makes for a pleasant daytime excursion plan if you are staying for more than a day in Trongsa and have finished doing all other sightseeing. Once you reach, look carefully at the stone walls surrounding the palace…they have spy holes that were used by guards. There is a small gallery which circles the courtyard on all 3 sides and the main building is tall with two dominant aisles. The ground floor and first floor were used as granaries and garrisons for the military. Right now, they are used as classrooms for monks. There are 3 rooms in the second floor that have royal artefacts, crafts and paintings. pay special attention to the 35 Buddha’s of Compassion and a grand painting of Guru Rinpoche’s paradise. The temple Sangye Lhakhang with its beautiful images of Shakyamuni Buddha and 21 taras along with chortens coated in pure gold and silver are of special interest. The palace has a rich collection of books (not accessible to public) and its grounds are used for archery matches. Right now, a monk community from Trongsa Dzong live and research here. The monks perform prayers and religious, social functions for the local community. Many bikers bike down the southern stretch of 23 km from Trongsa to the Rabten palace. The traffic is very light and the downhill roads from Trongsa make it an easy track. On the way, you will pass the lovely serrated rice terraces of Mangde Chu valley and the Takse Goemba along with several gushing waterfalls. Many trekkers also explore this route as a trekking option. In case you love hiking up the hillside then do visit the Karma Nunnery that’s just 15 minutes uphill from the Rabten family. Though small this nunnery provides an insight into the lives of the incredibly gentle yet hard working nuns (anim) who live there. You will pass by this Chorten en route Thimphu to Trongsa. This is modeled after the famous Swayambhunath Stupa in Kathmandu and has mystic eyes painted at all four points. Lama Zhida built this chorten in the 18th century and it was used to bury the remnants of an evil spirit that had appeared in the form of a gigantic malevolent snake and had been vanquished at this very point. If you are interested in hiking, then you will find the Mangdue Foot trail to be a viable option. This is a two-hour track that begins from near the View Point restaurant and ends at the Trongsa Dzong Western gate. The total distance is 14 km and you will need to trek for two and a half hours up a steep incline and then down to a spectacular cantilever bridge that spans the Mangde Chhu. If you are travelling with a guide or a driver, then ask them to run ahead and inform the dzong guards so that the gates are opened. You watching the gate open for your arrival will give you a unique almost royal experience. In case, you have some time to spare in Trongsa or your schedule is delayed for a day then do explore the lovely day hike to the north of Trongsa. Drive up to the village of Yuling to the north of Trongsa and then start trekking from the northern side of the Yuling Lhakhang after two hours of an uphill trek you will arrive at the Taphey Goemba that’s a lovely meditation retreat. If you have energy left, trek for an hour uphill till you reach the Gankhar Puensum that offers stunning Himalayan views. Another beautiful pass (altitude 3400 m) near the eastern side of Trongsa, the Yutong La Pass. If you are driving in from Thimphu to Bumthang then you will cross this pass on your way. There is a huge chorten and many strings of prayer flags around. This is a tricky place to visit in winter and there are no tea/ coffee shops around. The Gangteng Monastery and Ngelung Lhakhang are major places of interest nearby. About 48 km from Trongsa lies the famous Pele La Pass. You will take nearly 3 hours to cover this distance as the roads are quite rough. You need to drive past the Chedenbji Chorten (a popular picnic spot) and the chendebji village followed by the Sephu village. After this village, you will enter an area with lush broadleaf vegetation and this marks the settlement of Rukubji. There are Yaks straying around the farmland and there are beautiful pastures and bamboo groves. The Pele La pass (3420 m) is marked by many lines of vibrant prayer flags and provides a fantastic view of Mount Jumolhari, Jichu Drake and Kangbum. If you are driving in to Trongsa from Phobjika Gangtey then you will cross the Pele La Pass. The Raven Crown Resort offers a high-end living option near Trongsa. This huge resort has 33 luxury rooms and a full-fledged spa along with a swimming pool. The resort is 13 km from the Trongsa Town but if you want to stay away from the bustle of town life, this is a good option. The Trongsa Dzong is a good hiking point from this resort and you can go on a day hike to reach the western gate of the dzong before climbing up to the Ta Dzong. The resort offers amenities like central heating, bath tubs, luxury fittings, free wi fi, mini bar, tea/ coffee maker etc. the hotel offers pick and drop services, tour guides, packed lunches and will arrange hiking gears and tours and taxis for you. While travelling from Thimphu or Western Bhutan to East or Central Bhutan, the Chandibjee is a good place to stop and have lunch or consider as a staying option. The location is a little below the Thimphu-Trongsa Highway and is about 40 km from Trongsa. You must travel for one hour to reach Trongsa but if hiking and staying in nature’s lap is on your agenda then the location will work to your advantage. The proprietor seemed to be a trained artist as there are a number metal carved items, paintings and sculptures (some are made by him) being sold in the room adjacent to the dining room. The quality seemed to be quite good though there are cheaper shopping option in Trongsa town. The food served is Bhutanese or Continental and is of reasonable quality. The Chandibjee river flows nearby and makes for a good spot for photography or a quiet walk. The tariff per room per night is 2000 NU plus taxes. There is a gift shop and restaurant here that’s run by the same person who owns the Do Chu La Resort. The Yangkhill Resort is situated about 1.7 km to the western side of Trongsa town. The location is such that the Trongsa Dzong can be clearly seen from the balconies and some of the rooms. At night, the Dzong is lit up beautifully with lights and it’s a wonderful sight. The Resort is surrounded with blossom covered lawns which also has a stream, lily pond, artificial waterfall and a prayer wheel. The staff is gracious and are always smiling. The service is a little slow but that’s understandable as all rooms are spread out at a considerable distance from each other and the main building. Room number 101 to 104 have the best views. There is an in-house restaurant and bar where Indian, Chinese, continental, Tibetan and Bhutanese food is served. The wine collection is impressive. There are 21 rooms in the resort and the tariff ranges from 2899 nu to 4120 nu plus 20% tax. The only downside is that there are no televisions in the room but you will not miss their absence. The Norling Resort is located conveniently and the Dzong, local market, ATM and museum are both quite near the property. The rooms and washrooms are quite spacious, clean and well equipped. It would be great if you can ask for a room with a view of the Dzong as at night the Dzong looks spectacular. For breakfast, you will get simple fare like toast (with homemade butter and jam) along with eggs and fruits. The Norling brew their own Ara and their food is delicious though simple. Indian tourists will be happy to see their favorite pure sabzi being served. The food entree charges are quite cheap. The room tariff is 1800 NU plus 20% tax. Wi fi doesn’t work properly and water supply is a little erratic. There is a parking lot (big advantage). The Sherubling Lodge is located on a high ridge that overlooks the Trongsa town. If scenic location is your priority and you do not really crave luxuries, then the Sherubling is a great option. It’s a delight to sit on the lawn and savour tea while looking at the panorama of the mountain ranges and the lush forests. The old town of Trongsa also presents its best side when viewed from the lodge. There are sufficient amenities in the lodge like rooms with attached bath, in house restaurant and bar, money exchange facility, phone facility for calling international and domestic numbers along with heating. The best thing about this guest house is the view it offers of the Trongsa tower and Dzong (there is probably no hotel in Trongsa that offers a better view). The room décor (and the overall décor) is a bit worn out but some may find that charming. The rooms have okay-ish amenities with rather hard beds, electric heaters, cupboards and colorful comforters. The washrooms hot water supply is not regular but this happens with many hotels in Bhutan. No televisions in the rooms and the lack of Wi Fi may irk some travellers. The room tariff is also a little steep with 2800 NU for standard rooms and 4500 NU for deluxe rooms. Tax 20% is extra as always. Trongsa has very few restaurants and exploring the food options at your hotel is a better idea. Don’t forget to sample local specialities like paa (sliced beef and pork dishes) along with zow shungo (vegetables and steamed rice) and tapioca with sweet banana soup. Yak meat dishes are a speciality of central Bhutan so you should try that as well. The Oyster House is easily the most popular restaurant in Trongsa and that is due to the presence of the large snooker table inside. Teenagers living in Trongsa throng the Oyster House for playing snooker as there are relatively few entertainment options around. The menu is mostly Bhutanese and Tibetan. You will get hearty Thupka, momos (beef, pork, cheese, chicken), spinach and a range of other popular dishes. The seating arrangement is quite cosy and there is a terrace seating place which overlooks the town. Meal for two will cost around 400 NU. This is a great place to walk to for an early breakfast if you are all set to go for a hike from Trongsa town. The restaurant serves snacks, hot beverages, a decent range of drinks and some basic Bhutanese, Tibetan and Chinese fare. However, this restaurant is only worth going to if you stay in the outskirts of the Trongsa town like in the Raven’s Crown Resort or any of the surrounding lodges. A quaint combination of bakery and a general store shop…this shop will bowl you over with its medley of offerings. From banana cakes to chocolate pastries to meal loaves and minced pies, this is easily one of the best-known bakery shops in Trongsa. Even more interesting are the array of hand spun textiles, beautiful masks and locally sourced and made jewellery that’s kept on sale inside the shop. The prices are quite reasonable and you might want to pick up some souvenirs for people back home. 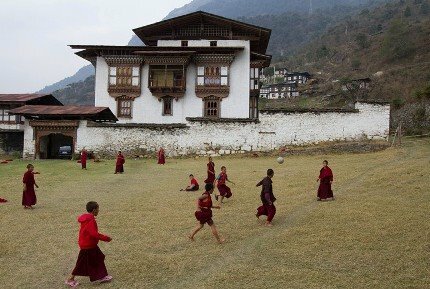 If you are in Trongsa, you will feel like exploring the charming countryside that offer many interesting tourist attractions. One of the major attractions is the Chendebji Chorten along with two other smaller chortens that make the confluence of Nikka Chhu with Nyala Chhu. A little further away is the charming little hamlet of Sephu that produces some of the finest Bamboo woven items in Bhutan. The Norbu Yangkhel restaurant stands here offering shoppers, travellers and trekkers (the difficult snowman’s trek ends here) the chance to sit and grab a bite. Apart from momos, thupkas and soups, you will get set Bhutanese lunches at 380 NU. The Juru Jaju soup here is a must try.